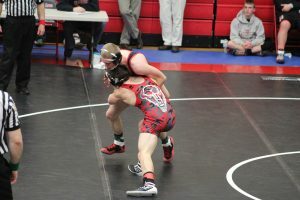 DUBOIS — After losing to DuBois in December 43-24, the District 4/9 Duals afforded an opportunity for the Bison to see how much they had closed the gap. Unfortunately for the Bison, the result was much the same – a very quick 47-27 Beaver win. The meet started off with a bang – four straight falls, each in under a minute. Three of the four went to DuBois, with only heavyweight Trae Kitko winning for Clearfield. Clearfield finally struck back at 126, as Jude Pallo racked up several takedowns on Tyler Myers before hitting a third-period headlock. The ref slapped the mat at 5:42, bringing the Bison briefly to within nine points at 21-12. “It took Jude awhile to get going, but once he did he really got aggressive and took it to Myers there. Good win for Jude”, said Aveni. 138 pounder Caleb Freeland scores a takedown here and went on to a 9-5 win versus the Beavers. The last competitive bout was a good scrap between Clearfield’s Hunter Wright and Dubois’ Brock Adams. Adams got the initial takedown in the first period,and built a 5-1 lead after two. A quick escape and takedown for Wright closed the gap to 5-4, and Wright pushed Adams hard for the last minute of the third but was unable to tie the bout, losing 6-4. “Hunter wears kids down, but he’s got to set a little better pace. When he picked up the pace in the third, Adams got a little frustrated. We want to see that pace a little bit earlier in the bout from him”, said Aveni. 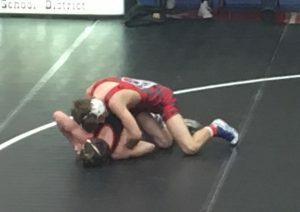 DuBois went on to defeat St. Marys 35-29 in the final and will now represent Districts 4 and 9 in Hershey at the PIAA AAA Team Wrestling Championships. They will face Erie Cathedral Prep, the District 10 champion, on Thursday. In AA action, Brookville won the final by a score of 67-6 over Coudersport. Both teams are entered in the PIAA AA Team Wrestling Championship. With their dual meet season complete at 7-9, the Bison will be off until the District 9 individual championships on February 25 at Clearfield High School.